Now I don't want to alienate you, but I can pretty much take or leave Julia Roberts. I mean, credit where it's due, she's an Oscar winner for Erin Brockovitch, which, confession time, I haven't seen. Pretty Woman was good though. I find that the "slippery little suckers" line is one you can use in just so many situations. Oh you remember, it's in the bit of the film where she is trying to eat escargot in a fancy restaurant and one snail shell goes flying across the room. Hilarious. Oh, and there's Steel Magnolias too. Who could resist Sally Field, Olympia Dukakis, Shirley MacLaine and Dolly Parton in the same film? Julia was a pivotal character but wisely remained a supporting actress among that lot. But these films are generally throwbacks to the 80s. So it was with a little concern that I found myself waiting to order pizza in L'Antica Pizzeria Da Michele in Naples last week with a recent picture of Julia Roberts beaming down at me. Good Lord, that mouth! You see, I didn't realise that one of Julia's more recent films, the rather critically, shall we say unloved, Eat Pray Love had a scene set in this very pizzeria. I was blissfully unaware of this since the film never hit my radar. I mean even the chicks I know didn't like this flick. 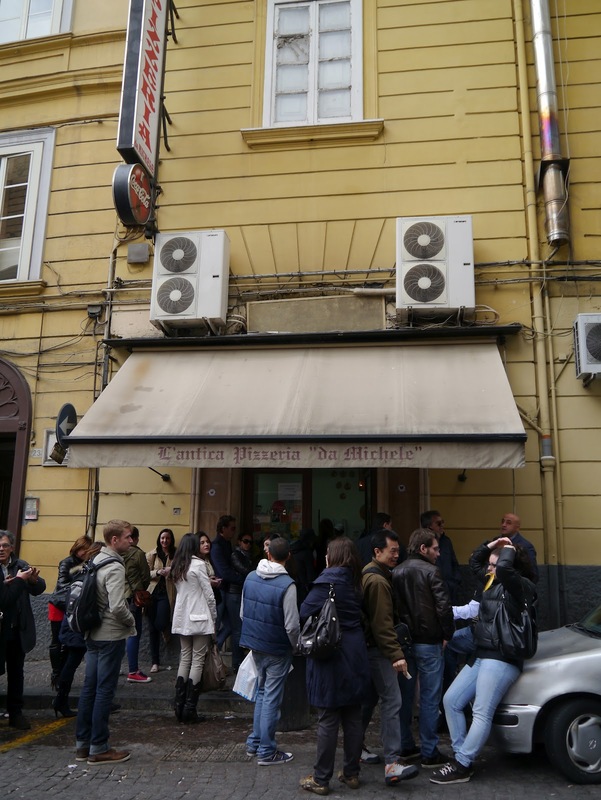 Thankfully, the patrons of Da Michele, a mix of locals and tourists, were not clutching copies of the novel and there was no discussion of muffin tops (I only know this reference because I watched the above clip, I swear). Can you believe how cheap this is? I wasn't here to walk in the footsteps of Julia, I was here for pizza. A pizza that has been made in Naples in the same location since 1930, but has a heritage stretching back to 1870. This is also a pizza that I have been reminded about for more than five years thanks to an earlier visit to Da Michele by Mr B with his sister, but sans moi. "Oh this pizza isn't as good as the one in Naples", he would say. "The crust isn't the same", he would moan. Seriously, a Da Michele pizza creates an incredibly lasting food memory. They almost become part of your food DNA. You see, this is partly, because Da Michele is simplicity itself. They cook just two types of pizza. The margherita (topped with tomato sauce, mozzarella, basil) and the marinara (tomato sauce, sliced garlic, oregano and oil). Actually there is one other option - double mozzarella on a 'maxi' margherita. You gotta respect an establishment that focuses on just two products. 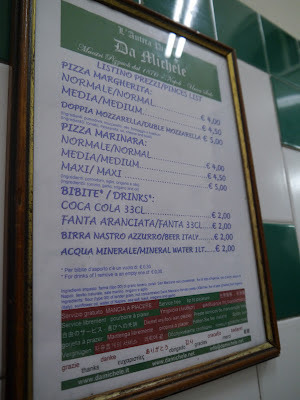 On our visits to Da Michele, and there were two in four days for which we travelled 75 minutes in each direction on chaotic Italian trains, we ordered medium versions of both types of pizza, a snip at Euro4.50 each. The core ingredient is the deeply flavoured sauce, made from sun-ripened San Marzano tomatoes grown on the fertile soil of nearby Mount Vesuvius. You could practically taste the sunshine in this sauce and if you ever needed an argument for provenance it is smiling up at you. The marinara was delicious with its scattering of dried oregano, the chunky slivers of chopped fresh garlic and swirl of olive oil. The margherita, with its mozzarella and small sprig of basil was a standout. The sparseness of ingredients serves to highlight the quality of each. But these toppings would be nothing without the wonderfully elastic crust which somehow achieves the simultaneous qualities of being not too crispy and not too chewy. This is thanks to the slow leavening of the dough and the wood burning oven which takes pride of place in the open dining area. It throws off a decent heat if you happen to get close to it. The oven crackles and slightly chars the edges of the pizza giving it texture and flavour. As for eating it, the elderly Italian gents we shared a table with both ate their pizza by folding it in half, calzone style, before diving in with cutlery. I noticed that all the animated talk between the two, including the five minute ordeal of ordering (I mean there are just two choices here! ), ceased the minute they started to eat. That's what this pizza does - it even silences an Italian. To experience Da Michele, make sure to grab a ticket from the front desk and wait patiently. It helps to know a little Italian numeracy too so that you don't miss your turn being called. We arrived at around 2.30pm and waited about half an hour for our table. This isn't a place that encourages you to linger either and you'll have eager diners hovering over you soon after your last bite, no matter how hard you try to make it last. So is this the best pizza in Naples, and ergo the world? Well I didn't try any competitors in Naples so I won't claim its divinity just yet, but it sure ranks as the best I've eaten. It certainly beats this abomination too. Sadly, all future pizza will be compared to this and most likely be found wanting. My only problem now is that if I want to eat pizza this good I'm going to have to hop a flight back to Italy.